ALDI prices are low, low. 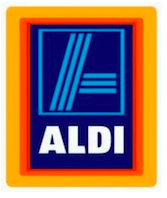 German based ALDI food stores has been stepping up their expansion plans in Brittan and in the United States. If you haven't been to an ALDI store, ALDI offers low, low prices but a limited selection. In Brittan, ALDI plans to open a store a week. The U.S. expansion is a bit slower. Last year, ALDI announced that they would be opening ten stores in Texas with future plans to expand into New Mexico and Arizona. Currently, ALDI is in every state east of the Mississippi except four. ALDI's first store in America opened in Iowa in 1976. Before you head to an ALDI store, grab some bags and/or boxes. None are provided. As far as offerings, everything ALDI has in their stores are their own store brands. You won't find Bob Evans sausage or Tide anywhere in an ALDI store. However, if you like canned goods, you'll enjoy a considerable savings. An 8 ounce can of store brand black beans at my local discount grocer is 99¢. ALDI charges 59¢. However, the produce section is limited to mostly large bags of common items, like oranges, lemons, and onions. A typical grocery store has 20 feet or more of shelf space dedicated to pasta. Every shape and size is there. At ALDI, you'll find about 25" of pasta shelf space - three varieties - that's it. Store brands can be scary. I have yet to buy anything at an ALDI, but I have been there to peruse their offerings and see how it would fit into my own buying habits. With the limited selection at ALDI, I can see that grocery shopping would become a two-stop excursion - one at ALDI and another at a larger store to fill in the gaps. ALDI is the type of store you visit once a month and stock up on common items that you and your family consume. I can't see someone making weekly trips there. If you do make that trip once a month, you WILL save money. Just don't forget to bring your own bags and boxes. ALDI offers low, low prices but a limited selection. However, you can put a dent in your food budget by shopping there and filling in the gaps at your regular store. Great Post as always.Just disagree with the every week visits.We as a Family DO go every week, and we do if you look close enough at the selection have enough meals for all seven days. Aldis runs what we call national specials, its seems that once every two weeks or so they change national foods. One time its Mexican, the next time its Itialian, even a chinese week, The selection may seem limited if you dont look , it did take a while to figure that out, but once we did it is the bulk of our grocery bill. ( we feed about 6 kids a nite and this store helps keep the bill low and their bellies full). And yes we do need to do the fill in shopping at other stores, but we still spend less that if we did it all at GE..